Session Initiation Protocol (SIP) implements RFC 3261 with full support for SIP client and server applications. Our SIP software is available with our comprehensive software library of algorithms and protocols to implement mobile, VoIP calling, voice and video conferencing, and multimedia applications. Contact us to discuss your specific SIP application requirements. Custom designs are also available. Session Initiation Protocol is an application-layer control protocol that can establish, modify, and terminate multimedia sessions (conferences) such as Internet telephony calls using Voice over IP (VoIP). SIP supports user applications that require the creation and management of a session, where a session is considered an exchange of data between an association of participants. The implementation of these applications is complicated by the practices of participants: users may move between endpoints, they may be addressable by multiple names, and they may communicate in several different media – sometimes simultaneously. Session Initiation Protocol can invite participants to already existing sessions, such as multicast conferences. 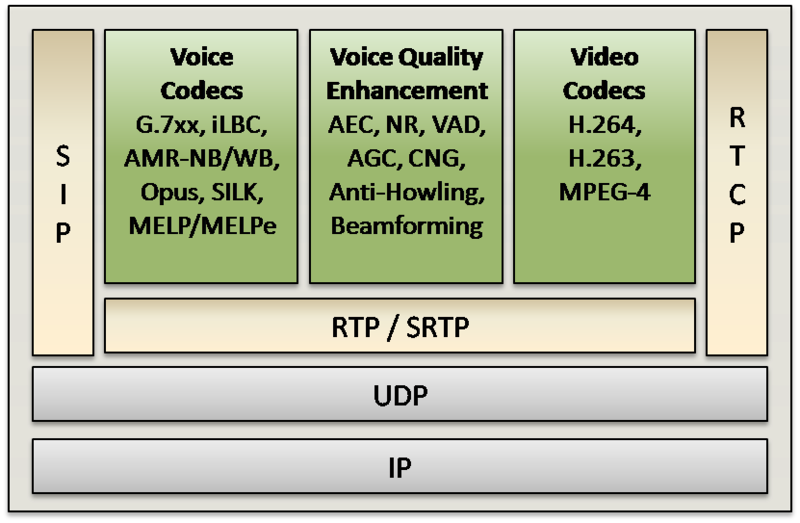 Numerous protocols have been authored that carry various forms of real-time multimedia session data such as voice, video, or text messages. SIP works in concert with these protocols by enabling Internet endpoints (called user agents) to discover one another and to agree on a characterization of a session they would like to share. Media can be added to (and removed from) an existing session. Session Initiation Protocol transparently supports name mapping and redirection services for enhanced personal mobility. To locate prospective session participants, and other functions, SIP enables the creation of an infrastructure of network hosts (called proxy servers) to which user agents can send registrations, invitations to sessions, and other requests. It is an agile, general-purpose tool for creating, modifying, and terminating sessions that works independently of underlying transport protocols and without dependency on the type of session that is being established. Session Initiation Protocol provides a suite of security services, which include denial-of-service prevention, authentication (both user to user and proxy to user), integrity protection, and encryption and privacy services. SDP for describing multimedia sessions. Redirects SIP INVITE requests to a user’s current location. Supports end-to-end and hop-by-hop authentication and end-to-end encryption using S/MIME.